African Dress- women Blue and Silver African buba dress and wrap or fully lined fitted long skirt. 4 piece sets with matching gele head wrap. Perfect for Bride, Mother of Bride, Wedding party and Formal Occasions. (Available in most sizes (Small to 3X-Large). Please add extra $25.00 for 2X and 3X-Large sizes. African Dress- Elegance Mudcloth Print Makeba Dress, with a matching Open Crown. New Design! Perfect for and all occasions. Elegant way to show off your heritage. Available in most colors and sizes. Extra fee will be added to sizes (2XL - 6XLarge). Please select your Makeba Dress Size. 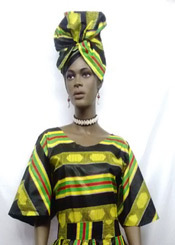 African Dress- Elegance Makeba Dress and Matching wrap. New Design! Perfect for and all occasions. Elegant way to show off your heritage. Available in most colors and sizes. Extra fee will be added to sizes (2XL - 6XLarge). African Dress-Ethnic Dashiki Print Dress w/Skirt. Elegant African Ashoke Buba Style black and silver trim wedding dress. 3Pcs. Buba top, long sleeves with Fitted Skirt, matching crown or hat sold separately at an amazingly low price! Perfect for bride, bridesmaid, and bridal parties. ((Available in all bridal colorsPurple Black, Blue, Fusha, White, Red, Beige, Green and Cream). From sizes (Small - 1X-Large). African Kente Bell Sleeve Top. New Design! Perfect for and all occasions. Dry clean or machine washable. Custom Made Items. 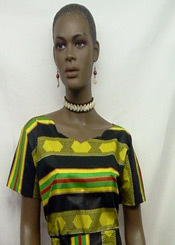 Kente Cap Sleeve Short Sleeve Top. New Design! Perfect for and all occasions. Dry clean or machine washable. Custom Made Items. African Kente Short Skirt w/Headwrap. Elegant way to show off your heritage. Perfect for all occasions and gift items. Made by WIlsdom Designs. African Kente Print Peplum Top. New Design! Perfect for and all occasions. Dry clean or machine washable. Custom Made Items.